Older and less energy-efficient HPS lighting near wildflowers. Photo by Callum Macgregor. Conservation is often a conflict between the demands of development and a desire to do what is best for the environment. It’s rare that we get the chance to report a decision which was taken for the good of people that has also panned out well for nature’s ecosystems. However, that is just what our new research paper found. Saving energy from street lighting is not just a green option, it also makes good financial sense. Two solutions in particular include replacing old High-Pressure Sodium (HPS) lightbulbs with new and energy-efficient Light-Emitting Diodes (LEDs) and turning the lights out entirely during the latter part of the night when fewer people are around. In the UK, these changes in lighting technology have been gradually taking effect over the last decade or so. While these decisions were made for good reasons, we knew little about how they would influence nocturnal wildlife. Our team of experts at York and Newcastle universities were interested in finding out how moths might be affected by the switchoff and new LED lighting, as they play an important role as night-time pollinators of a wide range of flowers, and have declined in abundance by 40% in 40 years. Light pollution, from street lights and other sources, has been suggested as a possible cause of this decline, though there are other factors such as climate change and habitat loss. Our previous research showed that under HPS street lighting left on all night, moths were distracted from visiting flowers and instead flew higher up, around street lights. This resulted in less pollen being carried by moths in lit areas, and a subsequent study by Swiss researchers demonstrated that this actually caused reduced fruit production. In our study, we asked whether the disruption to nocturnal ecosystems from street lights might be eased or exacerbated by the introduction of new energy-efficient LED street lighting. 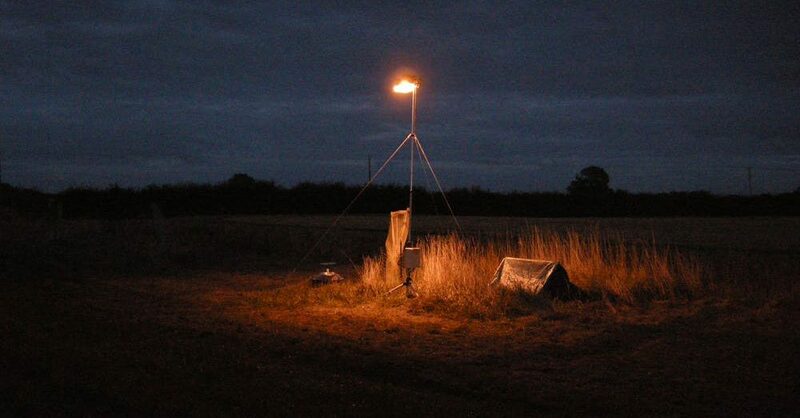 Working on farmland in East Yorkshire in the UK, we set up a chain of mock street lights alongside hedgerows that would allow us to manipulate the type and duration of lighting. We compared older HPS lights to LEDS, and standard full-night lighting to part-night lighting, in which lights were turned off at midnight. All lighting was compared to an unlit control that replicated natural darkness. Under each lit and unlit treatment we placed several plants of White Campion (Silene latifolia), a common wildflower known to be pollinated by both bees and moths. We left each plant in the field for four days and nights before measuring what proportion of flowers had been pollinated, and the weight and number of seeds in every fruit. LEDs are rich in blue light which is attractive to moths but we found no difference in the rate of pollination between plants under LEDs and those under HPS lights. Our data did show that the differences between pollination under full-night lighting and in natural darkness were erased when lights were turned off at midnight. Surprisingly, this wasn’t just a partial improvement. We found no significant difference between rates of pollination in part-night lighting treatments and in natural darkness, and this suggests that turning lights off at or after midnight may allow nocturnal ecosystems to function as normal in the second half of the night. These results are quite encouraging. Local authorities can save money and energy from street lighting and help nocturnal ecosystems recover from light pollution at the same time. So there’s no evidence that the switch from HPS lights to LEDs increases the negative impacts of lighting on wildlife, and even better, switching to part-night lighting actually appears to reduce them. By switching lights off at midnight there is the potential to tackle two issues at once – reduce energy bills and the ecological impact of light pollution. This article originally appeared in The Conversation and is reproduced here under the terms of CC BY-ND 4.0.